The Union Project Dance Company arrived on the LA scene just two years ago, and has participated in a number of festivals around the LA area, quickly gaining exposure within the community. Tonight’s fundraiser was held to raise money for their first self-produced, evening-length performance to be held in August of this year as a culmination of The Union Dance Project’s work as the LA winner of Breaking Glass (a mentoring program for female choreographers). ARC Pasadena was an ideal and intimate space for the event, as attendees conversed in the lobby over wine and Brazilian sweets before entering the performance space to view two solos by Artistic Director and Choreographer Mariana Oliveira. The first solo, performed by Heidi Buehler, entitled How It Happens was a gesture- dominant work set to a soundscape that blended the Kronos Quartet with spoken excerpts by I.F. Stone. The introductory movement phrase included detailed upper body gestures, with a rich palette of qualities that morphed as the phrase was repeated again and again, faster and faster. The use of repetition was seen throughout the piece as short phrases resurfaced in different sequences and context, mirroring a theme of history repeating itself as indicated in the text. Buehler performed with great strength and stamina in this piece that demanded intense physicality and expressivity. While the text elucidated some of the themes of human nature and society, there was no definitive indication of who this solo character was, or how exactly she related to the foreboding narrative of humanity’s future. Buehler clearly manifested the character’s emotional stress in her wringing gestures, marathon energy and facial duress. But, all of this came in broad brushstrokes causing me to wonder if this powerful woman was actually of this world- or merely an observer of this world. Certainly Buehler’s exquisite technique could launch her into an other-worldly realm, yet her grounded quality combined with Oliveira’s extensive earthbound movement left this question unanswered for me. 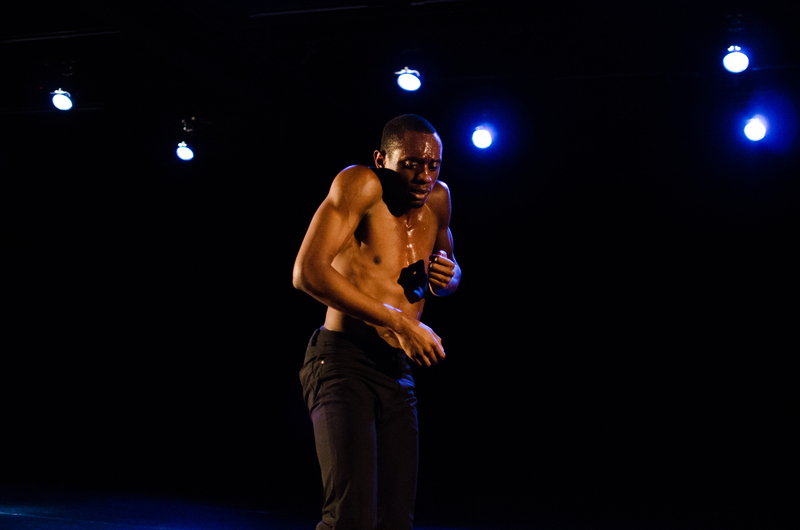 The second solo was performed by Raymond Ejiofor and possessed a stronger sense of place and purpose. Mirror in a Mirror demonstrates Oliveira’s skill in blending gesture, emotional drama and athleticism into a work that is compelling, visceral and personal. Ejiofor performed exquisitely. His ability to both launch his body into risk and also rein himself back into balance again makes this piece especially powerful in performance. Oliveira knows her dancers well, and this solo demonstrated her ability to draw out the best in her performers. The emotional piece, portraying the story of a man at the end of his life, utilized Arvo Pärt’s haunting piece Für Alina to create a sense of intimacy and tragedy in this man’s story. Ejiofor transformed himself in and out of each emotional moment with an adept sense of theatrical craft. His awe-inspiring ability to turn and spring and extend conveyed the desperation in this anonymous man’s struggle that could be everyman’s struggle. These were the first solos I have seen of Oliveira’s, and they possessed the same confident gravity that I had seen in her past work. Oliveira has a fearlessness that allows her dancers to invest fully into her work and abandon themselves in the process. I look forward to seeing more of her solo group work in her upcoming performances. To learn more about Mariana Oliveira and The Union Project Dance Company visit www.tupdance.com.